Goku Jr Son Goku Jr Vegeta Jr. Bejita Jr. It has been around seven years since the end of the Boo Saga on Dragon Ball Z, Goku is now training with Uub, Vegeta and Bulma are still living together with their children, Trunks and Bra. Trunks is now the head of the Hoi Poi Capsul Corporation (Capsule Corp.), and Goku's grandchild, Pan, is now 14 years old. The series begins when with Emperor Pilaf (Emperor of what?) and his lackeys using the Dragon Balls to wish for world dominance again (see the very first saga of Dragon Ball). Luckily for us, he accidentally wishes Goku back to his younger self. Unfortunately, Pilaf was using the black star Dragon Balls (suspected to be created by Piccolo Diamoh). If the black star Dragon Balls are not reunited in one year the earth explodes. Getting even worse, instead of spreading around the world like normal Dragon Balls, the black star Dragon Balls spread around the galaxy. It is decided that Goku and Trunks would then go around the galaxy searching for them. Unfortunately, Pan becomes a stowaway. 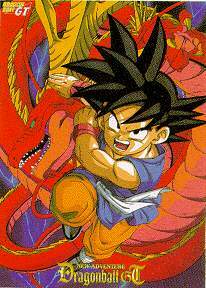 Dragon Ball GT is separated into two sagas, the Bebi Saga, and the Evil Shenlon Saga. During the Bebi Saga, Pan, Goku, and Trunks run into a robot named Giru who eats the Dragon Radar, but by eating it he now has the ability to find Dragon Balls. The trio has no choice but to bring him along. Soon they meet a professor (Dr. Miyu) who is also searching for the Dragon Balls. Unfortunately he is killed by Bebi, the last of an ancient race of aliens known as Truffles (Tsufurujin in Japanese), but Bebi is eventually defeated by Goku in Super Saiyajin 4 mode. The Evil Shenlon Saga is where Dr. Miyu and Dr. Gero Team up. They are both killed (again), but in the process of defeating them, the regular Dragon Balls crack. This meant Pan, Goku, and Giru had to go searching yet again, only this time on Earth. Each Dragon Ball released an evil Shenlon, which Goku and his friends eventually defeated. Shenlon then announced that it was time for Goku to go with him. After a quick tour of the world, Goku and Shenlon disappear, forever. The series is ended off with a TV special starring Goku's great great grandson, Goku Jr. Note: The US version has one addition recap episode that the Japanese version didn't have, because the first 16 episodes weren't aired at first so they needed an episode to sum up the story thus far. Later on, the 16 "missing" episodes were aired. The above description came from Michael Ryan, and was edited by yours truly (contact me). The first part of the Evil Shenlon Saga is often called the Super Android 17 Saga. Dr. Myuu (who was killed by Bebi) and Dr. Gero create the android Artificial 17 in Hell. Artificial 17 finds Android 17 on Earth and fuses with him making Super 17. Goku gets tricked into going to Hell and fighting the restored Cell and Freeza. Meanwhile on Earth, Super 17 is causing chaos. Krillin is killed in the battle. Goku, having defeated Freeza and Cell, is trapped in Hell. Piccolo, who is in Heaven, acts evil so he is sent down to Hell. Here Piccolo and Dende create a portal which allows Goku to leave Hell. Goku then kills Super 17, with 18 helping by pretending she still has a bomb insider her. The Z warriors gather the Dragon Balls and summon Shenron to revive everyone killed in battle. However there has been a malfunction, and an evil Shenron appears. Because of all the negative energy used by the Dragon Balls in the past, seven evil Dragons have been formed, one for each Dragon Ball. They all appear from a cloud above Shenron and fly to different parts of the world and destroy everything in their paths. The Z warriors set off to look for the evil Dragons. The above description came from The Karin Sanctuary, and was edited by yours truly (contact me).